On my journey to understand the process of clearing mines and other XO and UXO, I have met with various landmine action operators in Cambodia. It’s good to see that all the organisations seem to employ only a limited number of foreigners with the actual fieldwork done by locals. I have always been particularly interested in how landmine action affects the lives of mine action officers clearing their own land, especially women. In fact, women generally seem to be deemed especially good at this work. 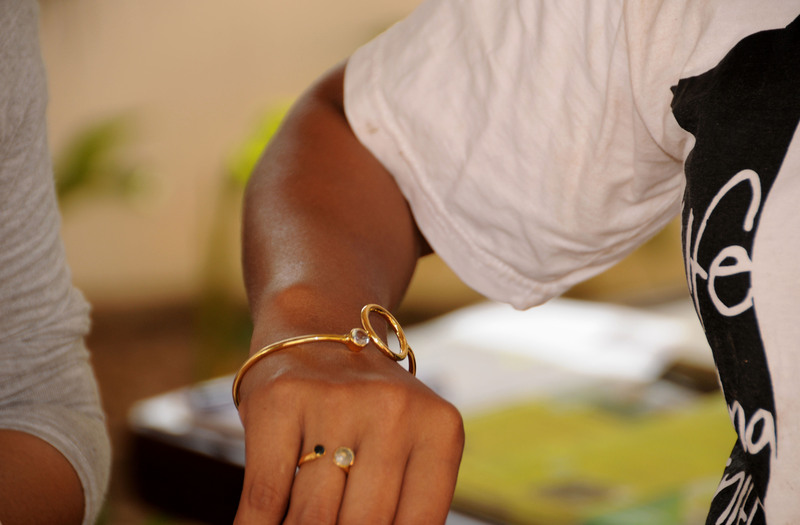 That is why we decided to focus our support on landmine action wholly on local female employees. Norwegian People’s Aid is the global leader in mine and explosive detection dog training. 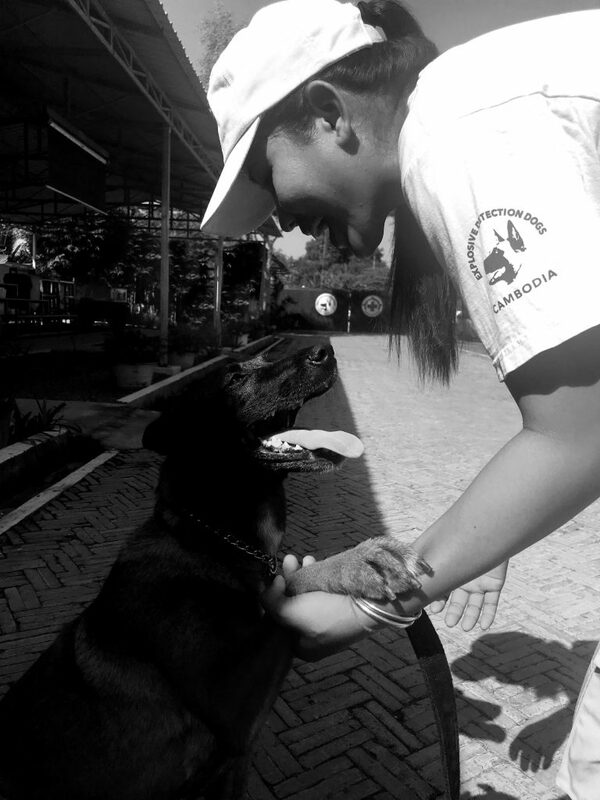 These heroic dogs help to protect lives by supporting landmine and unexploded bomb clearance across Cambodia and the world. NPA’s presence in Cambodia dates from 1992 with the first deminers deployed to the north-west of the country under UN auspices. 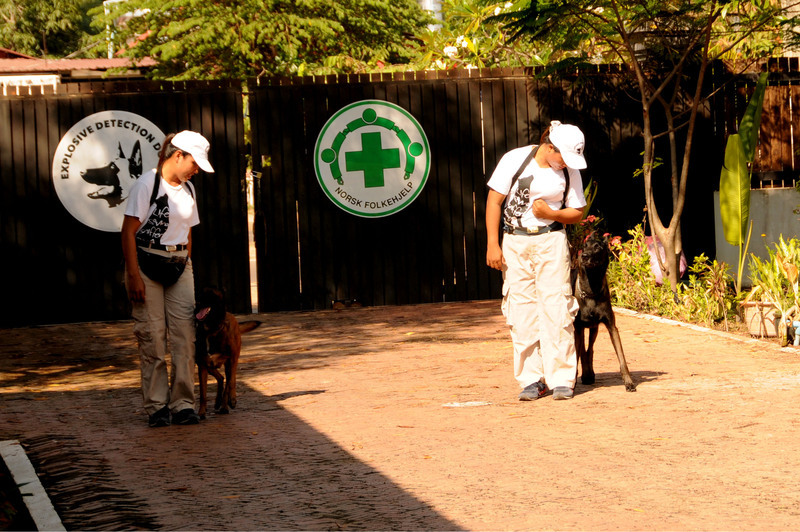 They have been collaborating with the government demining teams, providing 60 dogs to CMAC. Today the NPA works mostly in Ratanakiri province to clear cluster munitions. The NPA have the biggest landmine detection dog capacity in the world. They work with the Belgian Malinois breed of dog as they are strong, shorthaired, and have a robust hunting instinct. They also employ mostly women. I couldn’t wait to meet them at their demo centre in Siem Reap. After a briefing by Cally who heads up the demo, we meet the delightful duos Srey Nich with Axel and Vannoch with Inna. Srey Nich (32) has already been with the NPA for 6 years. Before working at the demo centre, she was out in the field in Ratanakiri where her team found a lot of UXO. She loved the work as she had witnessed an accident before, so working to clear lands was a cathartic experience for her. Vannoch (31) was working as a cleaner in Thailand when she heard a vacancy announcement by the NPA on the radio. It is clear that they both love what they do. “Even though we may have less physical power, women can do these jobs just as well as men can,” Srey Nich said. Both of them are happy with the opportunity to do something more meaningful than looking after cows or cleaning because they are empowered to contribute to a better Cambodia. We learned that the successful detection of explosives by dogs is based on utilising the animal’s urge to play. If the dog is not in the mood to play, then their search is not reliable. This makes the relationship between dog and handler critical. Axel and Inna showed us both long and short leash techniques. We were invited to hide a tiny cube toy (while the dogs weren’t looking), and each dog was chomping at the lead to go and show their quick skills in finding it. A normal dog will look for the most focused smell and stand on it. 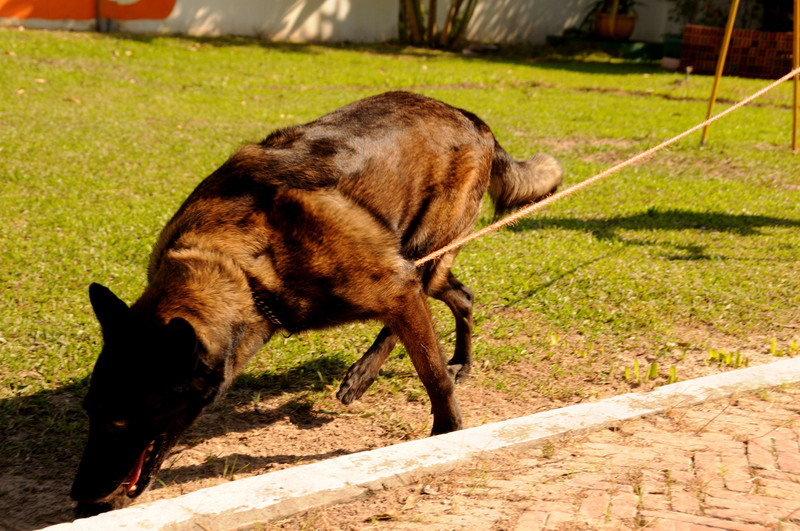 But landmine detection dogs are trained to walk around the smell, find the focus of it and then point with their nose. This way, no dog has ever died on the job. As puppies, the dogs start training for their 8 years of service with a toy kong, a rubber toy with a hole in it. A piece of food will be inserted in the hole and the kong hidden. Over time, the food is mixed with more TNT and the kong made smaller and smaller until there is only TNT. They can sense this a couple of meters below the surface of the ground. By 18 months of age, the dogs are fully trained and can detect microscopic pieces of explosives in open field environments. Definitely not house dogs, Inna and Axel looked big and boisterous but were adorable at the same time, lifting a paw at the command “Nice to meet you!” It was good to see how much fun both dog and handler were having, providing a neat balance for what really is quite a serious job. After the captivating demo, we visited the training centre where we saw the other dogs and the exercise yards. The NPA works closely with the Norwegian government and other donors and as such has access to state of the art equipment and expertise. What happens when a dog gets sick in a remote area? The NPA’s mobile veterinary clinics can be situated where fieldwork is based. This extends the service life of the dogs and speeds up land release. 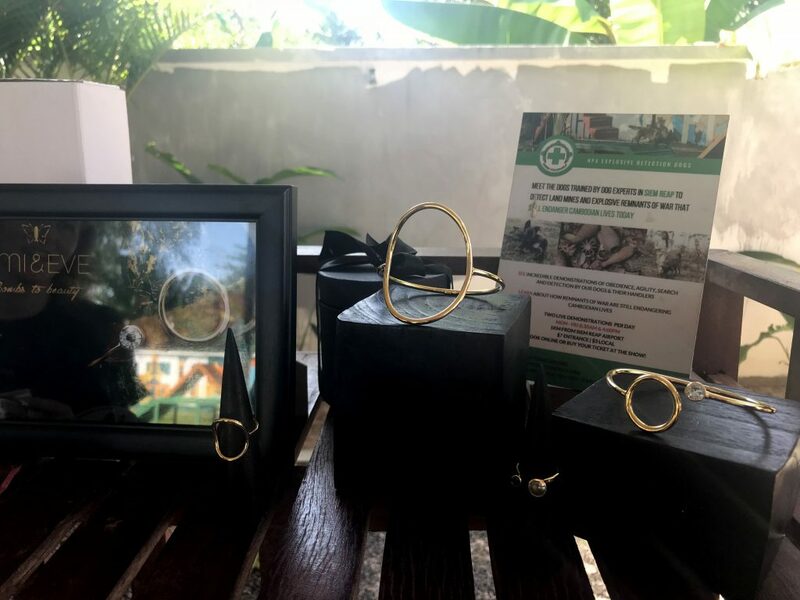 One of these mobile clinics was stationed here and we met Elisabeth, the NPA vet from Colombia (“three days from home!”) who was getting ready to join the teams out in Ratanakiri province. Interestingly a staff member from Apopo was just meeting with her. 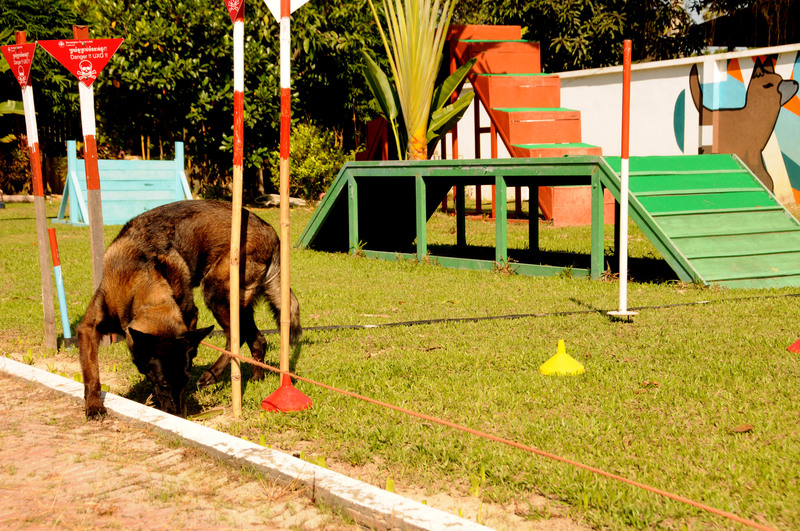 Apopo works with landmine detection rats and collaborates with the NPA’s vets and clinics. We had already adopted Magawa, a mine detection rat at Apopo, so it was nice to see this teamwork. So what happens when the dogs retire? Some of them are understandably adopted by their handler. 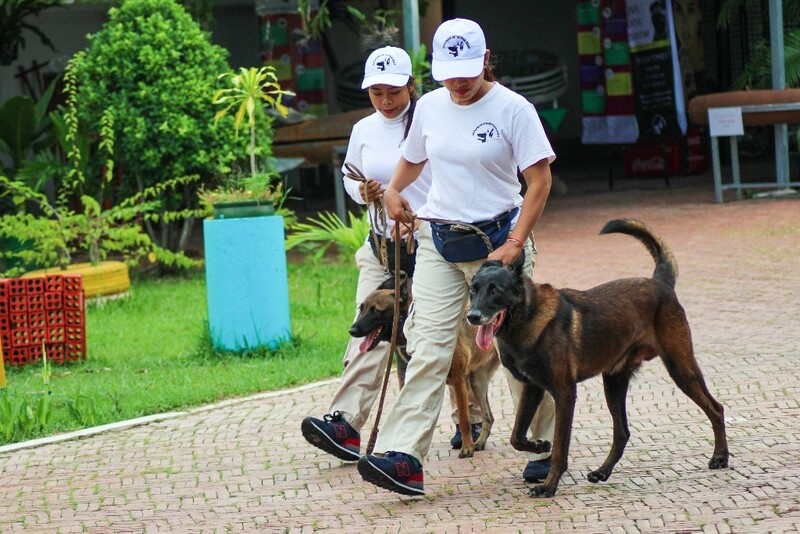 Now there is also Home of Heroes, the world’s first retirement home for ex-demining dogs. 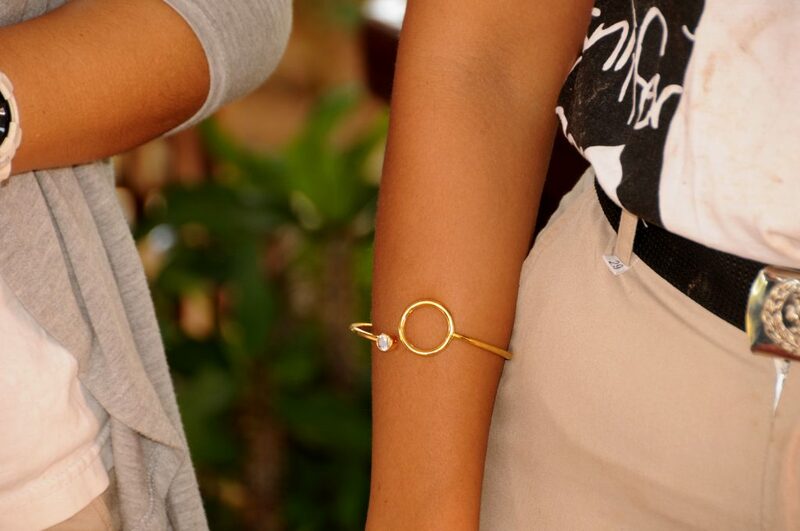 And what did the girls think of jewellery made from ERW? See for yourself in the pictures below! 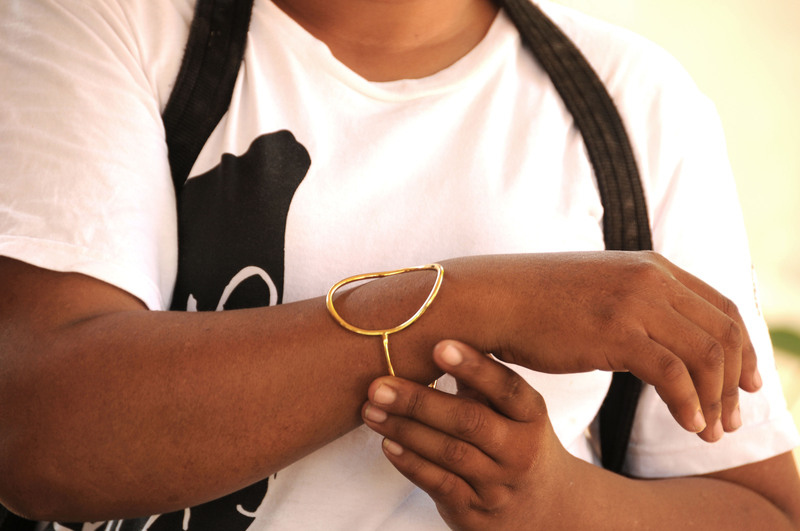 We donated 20 pieces of jewellery to the NPA and they are on sale in the demo centre shop. Name your price…..all proceeds go to the women dog handlers.